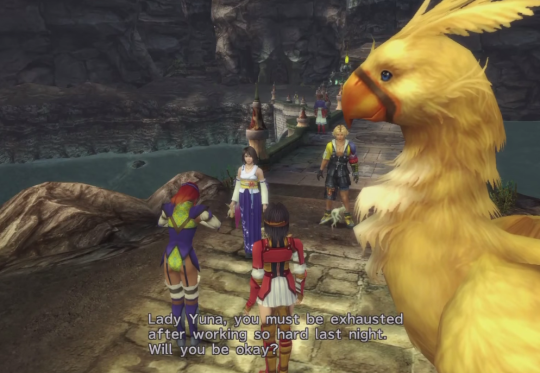 Let’s pause on our journey south from Djose Temple, where Yuna’s summoner party has stopped to chat with Captain Lucil and Elma, the sole remaining Djose Chocobo Knights. 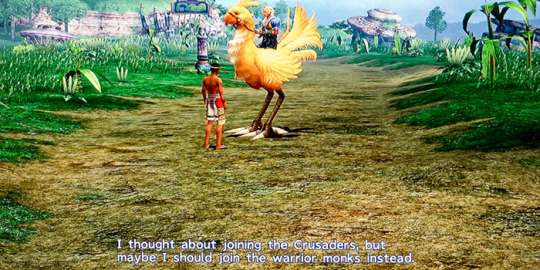 They have one chocobo left, plus a squire in hand-me-down warrior monk armor who doesn’t seem happy with his lot. Let’s listen in. Looks like the good captain’s not too caught up in her own woes to appreciate the young summoner’s aid. 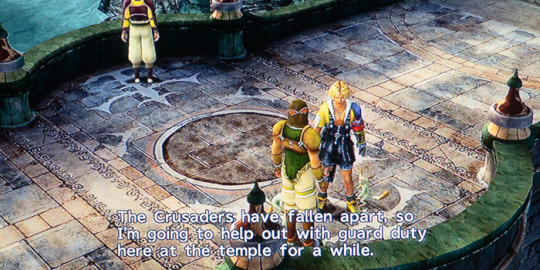 The rumor is that Lady Yuna remained at Djose temple after acquiring her aeon to tend injured soldiers. But now she’s resumed her pilgrimage, which was delayed at least two days by the Crusaders’ pointless operation. 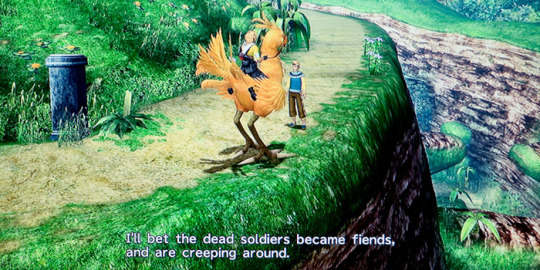 What of the Chocobo Knights? 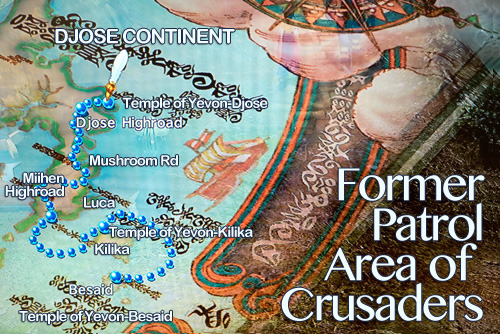 Lucil: First we cross the Moonflow, and then we head north in search of chocobos to replace those we have lost. 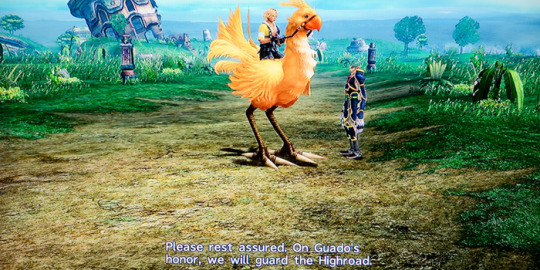 Elma: Once we find chocobos, our Mounted Forces will ride again! Looks like utter disgrace and defeat can’t keep these ladies down. That’s something that sets them apart from their fellow Crusaders. Sadder and wiser, most of those who took part in the operation are so demoralized that they can’t do anything more than pray for their fallen comrades. Many are returning home. A few have volunteered to stay on at Djose to protect the temple. 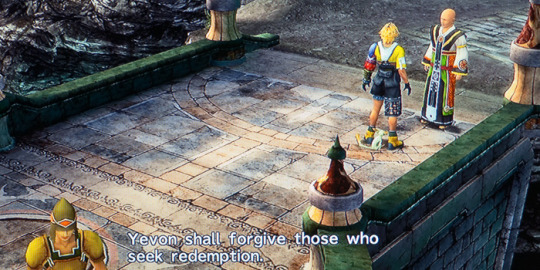 Almost all are vowing to atone for their transgressions and rededicate their lives to Yevon. They loudly denounce the machina they were boasting about just yesterday. Of course, Djose Temple is saddened to see Lady Yuna depart. “Should you need a place to recuperate, please return. You are always welcome here.” the temple summoner assured her warmly. Alas, the chances of her coming back this way are slim, but if she does, you can be sure that they’ll put out the red carpet for her. 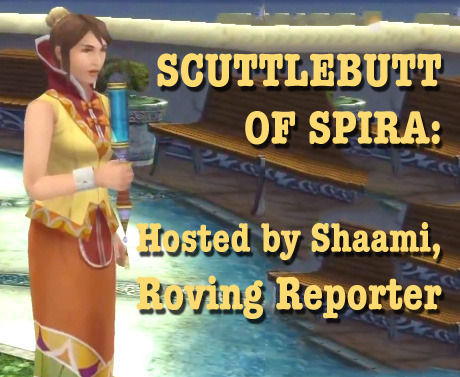 Leaving the causeways, we head south along the Djose Highroad, passing Yuna’s summoner party which has stopped to consult a map. “Moonflow baby, here we come!” crows a young man whom some of our viewers may recall from the tournament, the Besaid Aurochs’ new star. 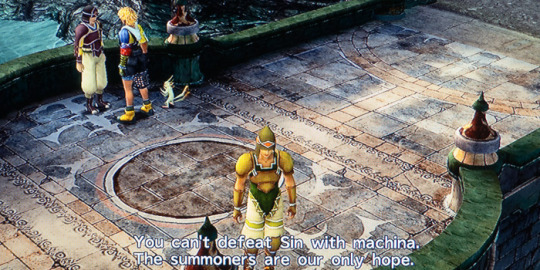 Lady Yuna certainly seems to like her blitzball players. We Lucans can’t fault her good taste! A wounded Crusader warns us the fiends have multiplied along the Highroad in the wake of Sin’s attack, but we press on, undaunted. On the edge of the battlefield, we find our way partially blocked by an enormous toppled machina, which is causing problems for the local merchants trying to resume their regular routes. This man can’t get his wagon through, and he's mad as hell! 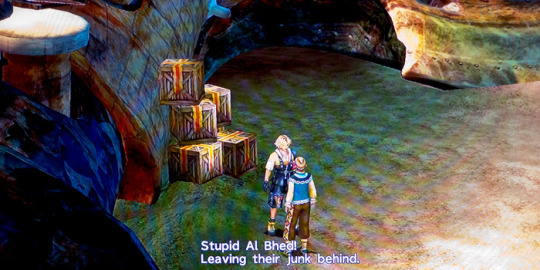 It’s likely that most of the fiends in this area are Al Bhed, thanks to the heathens’ lack of respect for the teachings. Who would send them, after all? Yes, dear viewers, we’d best remember exactly who led the Crusaders astray. The Djose Highroad is tough going, with no Crusaders left to cull the fiends. At last, passing the turnoff to Mushroom Rock Road, we come across an unusual sight: a Guado and a Warrior Monk posted on sentry duty. Well now, that is certainly an exciting turn of events, ladies and gentleman! The Crusaders have guarded the lands from the Moonflow to Luca for eight hundred years, ever since Lord Mi’ihen founded them. 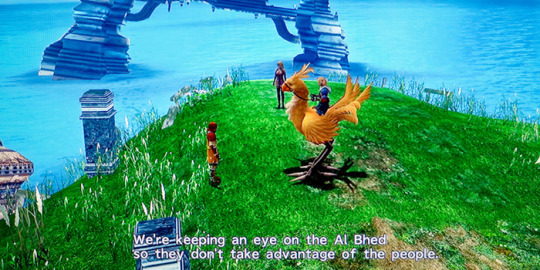 More recently, the elite Djose Chocobo Knights chapter of the Crusaders has been a byword for security and authority all along the Highroad between Luca and Djose, the most important temple in the region. How the mighty have fallen! Not everyone is content with this change. The sergeant, who wants his name kept off the record, expressed dissatisfaction at his new posting: “I'm just a measly sentry now that the Crusaders failed. Why do I have to suffer for what those faithless morons did?” But he has nothing but praise for his “reliable,” if “brusque” Guado comrade. Continuing south, we reach the remains of the Crusader checkpoint that had clogged up traffic for days. 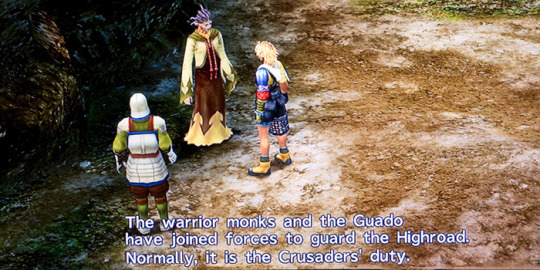 Another helpful warrior monk informs us, “We are securing the Highroad under Maester Kinoc’s orders.” What a relief! 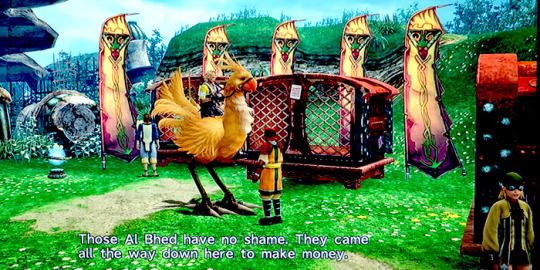 Unfortunately, just past this spot, we find an Al Bhed merchant shamelessly exploiting the plight of the Crusaders by renting chocobos to passersby, the only way to traverse this area safely while the Djose Knights' patrols are suspended. “Sooner or later, we warrior monks will crush the Al Bhed,” the new checkpoint captain boldly asserts. You heard it here first, folks! A sobering thought, particularly for their loved ones. Come to think of it, the Crusaders in Operation Mi’ihen may have been inadvertently fighting some of their own former comrades slain in last year’s ill-fated Djose battle. Thankfully, it appears that the warrior monks may be looking into the Al Bhed situation, which has been something of a blind spot for the Crusaders. Sadly, some of the Crusaders haven’t learned their lesson. 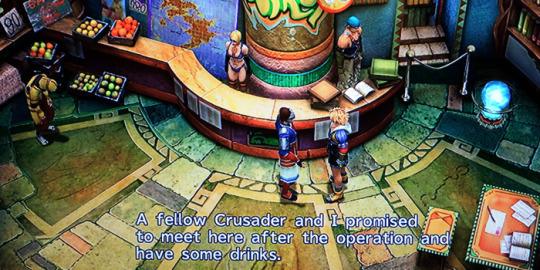 We found these two soldiers in the Highroad Travel Agency, one of them waiting for a comrade. We ran across tragic stories like this all up and down the Highroad. As we draw near the bright flags of Luca, we are gratified to meet another of Maester Seymour’s people lending the warrior monks a helping hand. With Guadosalam so dependent on trade and tourism from points south, it’s no wonder the Guado have pitched in to get the Highroad reopened as quickly as possible. It looks like at least some people are getting the message. Well, you’re in luck, young man! With all the new positions opening up under Maester Kinoc’s command, you’re sure to find quick advancement. Oops! We’re up against a commercial break, folks. Stay tuned for more exclusive coverage as we explore big developments in Luca!